photomom had the most liked content! Hadn’t stopped by chat in a while. Wasn’t sure if it was discontinued or I had done something to erase it. Hopefully we can get it back as it was the easiest way to get there on my iPad. The Humble Bumble finally made it into the sky. It flies great and I love the loud buzz. Busy, busy weekend. I loved it. It’s been so long since I’ve won I’ve forgotten which buttons to push to influence (bribe) the RNG. The sweet, little furry creatures in Star Trek were “Tribbles”. Trlbys? You have Trlbys? I like Trlbys. Don’t get me wrong, I’d like a Djinn, too. 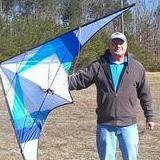 But gTrlbys were my first stunt kites. 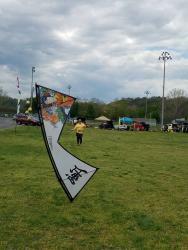 Just got confirmation that I have a space at the Maryland Kite Society’s Kitebuilders’ Retreat. Any one from here going, too? It’s always better to have some familiar faces at these things. Especially when it’s your first time.